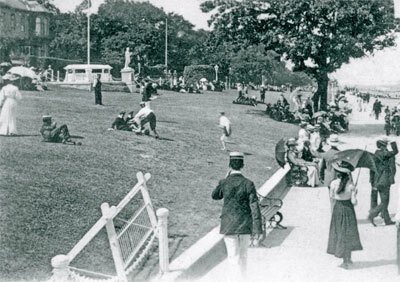 Prince's Green (originally just 'The Green') was presented to the people of Cowes as a public open space by George Robert Stephenson (cousin of the better known civil engineer, Robert Stephenson) in 1863 to mark the marriage of the Prince of Wales (the future Edward VII) to Princess Alexandra. One condition of the gift was that the site should never be used for any commercial activity. There are still the shelters and a drinking fountain dating from Victorian times. At one time there was a bandstand towards the eastern end, but that has gone.